I wonder of you might be the first person in history to have flown Ditchling Beacon and Minster Cliffs on the same day? No doubt someone on here will know, if not. Top marks for landing the big scalie at Ditchling! How did you do it? I think the landing zone is quite shallow with a fence in the way isn't t? The trick I believe... Is to not show photos, or talk about the plane (Kit) after the landing! The field behind the second fence was used as a landing zone by two of the Mill Hill Gang, with their scalies. We won't talk about the third scalie landing, but I think a third fenceline was involved. I was not aware that we were allowed to do that and landed the Fully-ballasted Calypso in between the fences a couple of times. It was physically restrictive where I did it, and in retrospect, I should have walked east along the ridge 100m and landed where the gap between the fences is wider. 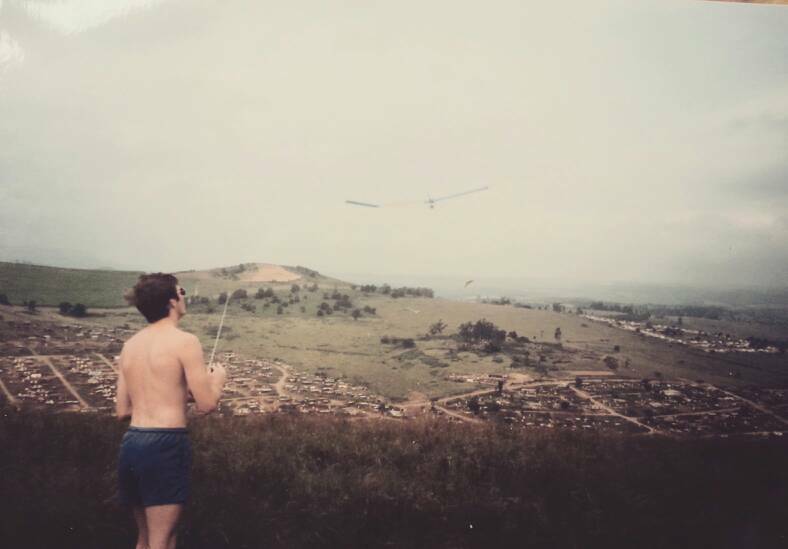 Just found this 20 year old photo of me slope soaring back in South Africa. 1. I was allot thinner! 2. It was allot warmer! Not looking promising for maidening my little ASG29 tomorrow, late afternoon at Bopeep may be doable...I'll be watching the forecast intently! That pic of Rob reminds me: shall we have a slope babe competition this year? Note sure I am too happy with that memory coming to mind? I think the 30% ASG29 maiden will have to be put on hold for a couple of weeks, conditions don't look like ideal today and I'm away this weekend...at lease it'll give me time to tart up the scale bits. And put a pilot in! I'm hoping to slope it first! Just found this nice pic of one of Simon's old planes at Firle, so I thought I'd post it. I wonder if that plane still exists somewhere? You could always put it in my yard. Does that mean we can publish the 'action arrival' material from Friday please Allen? anyone know what the back story is here? Last time I saw them neither of them was wearing a skirt and had long hair. Written on my mobile. Please excuse my brevity. I think like many visitors to Thailand you might get a nasty surprise Martin! That was my Buccaneer on Colley Hill yesterday. Depron build to 1/8th scale and weighs 7.4lbs. It's done in the colours of a SAAF machine being restored to static at the moment in Cape Town at the SAAF Museum. Incidentally Rob, that's where I'm from. Good job Monz! Get yourself down to Thurnham, we'd love to see your Buccaneer! I'm so bloody naive, thanks for the heads up Simon. I have now made a mental note, when watching videos on my phone don't comment till I've seen them on a big screen! Do you have a decent hill there? I'm in Tolworth, so an hour or so along the M25 and M26. Postcode or map and best wind direction? ME14 3LD takes you to the lane at the bottom of the hill. SW to W, 'decent' is a bit of an overstatement...but what we lack in lift, we make up for in banter! Cool, I see parking on Castle Hill (there's a chap with a glider on Google maps ) and then walk which way? East or West or drive in to the circular car park off the A249? It's a brave person who maidens a plane like that at Colley Hill, well done. Page created in 0.895 seconds with 99 queries.